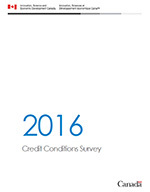 The Credit Conditions Survey was conducted between January and March of 2017. The questions were fact-based and focused on financing sought by small enterprises (1 to 99 employees) during the 2016 calendar year. A total of 2,111 small businesses completed the questionnaire, which included 24 questions. This is the second largest Canadian survey on small business financing. The margin of error is 2.1% for questions addressed to all respondents. R.A. Malatest & Associates administratered the survey for Innovation, Science and Economic Development Canada. The following tables present the key statistics from this survey. A request thfaat received either full approval or partial approval was considered "approved". A firm that developed or introduced a product, process, organizational or marketing innovation in the 2016 calendar year was considered an "innovator".